South Korea battled yet another day of thick fine dust on Sunday, with alarming levels of pollution spurring related authorities to take emergency measures. The Ministry of Environment said it requested metropolitan and regional governments to take procedures in accordance with guidelines to prevent the fine dust level from rising further. Possible measures include emergency operations of air "cleaning trucks" during the day, reducing operation hours of public facilities, such as garbage incineration plants, and issuing advisories, the ministry said. Depending on the air quality towards the evening, it will decide whether to recommend the government agencies to extend the measures for another day. According to Air Korea, a state-sponsored air quality tracker, the ultra-fine dust level stood at 106 micrograms per cubic meter (㎍/㎥) in Gyeonggi Province, and 101 ㎍/㎥ in the capital city of Seoul and North Chungcheong Province. The figures all fall under the "bad" category, according to Air Korea's classifications. 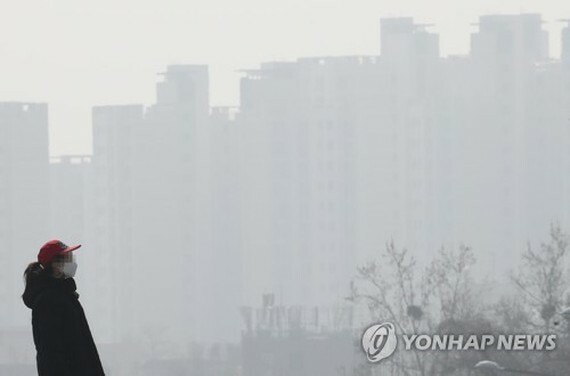 The weather authority already issued a bad air advisory for Seoul as of 8 p.m., Saturday. Source from the Yonhap.